This document has been created as a quick user guide explaining how to get started with ZVNCloud. Follow the next steps and start using the load balancing in the cloud! 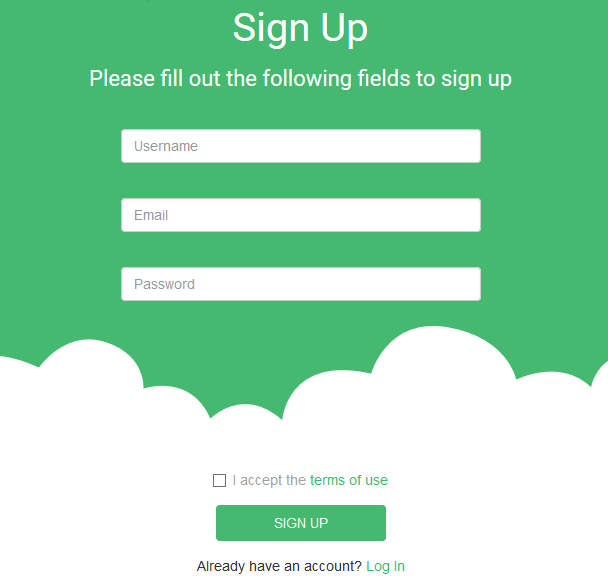 New users have to create a user account by clicking on ‘SIGN UP’, filling out the form with your details (username, email and password) and clicking on Sign up button. If you already have an account, insert your username and password in the ‘LOG IN’ form to configure your farms! The next step is to create a billing account. First, go to ‘Billing’ section, click on ‘CREATE BILLING ACCOUNT’ button and fill out the form with your details. After that, you have to register a valid credit card and click on ‘CREATE’ button. Perfect! Once you create your billing account, you will be able to create your first farm! In ‘FARMS’ section, you can create farms clicking on the ‘CREATE FARM’ button and filling out the form with farm data (product, farm name, profile, region and port number). Farms with GSLB profile have a default port number, 53. 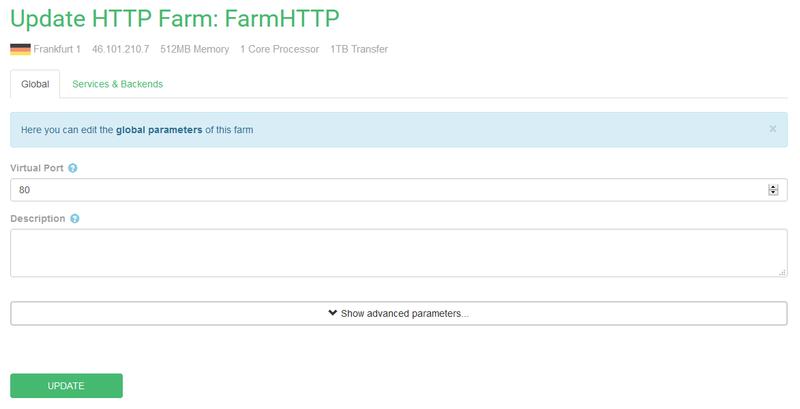 For this example we are going to create a farm with HTTP profile, Frankfurt region, 512 MB Memory, 1 Core Processor and 1 TB Transfer. Once you have filled out the form, click on the ‘CREATE’ button. In less than 2 minutes you will be able to configure your farm, modify its parameters, add backends and start the load balancing! To configure the created farm, go to ‘FARMS’ section, click on the name of the farm that you want to configure and you will be able to modify all the parameters of this farm. 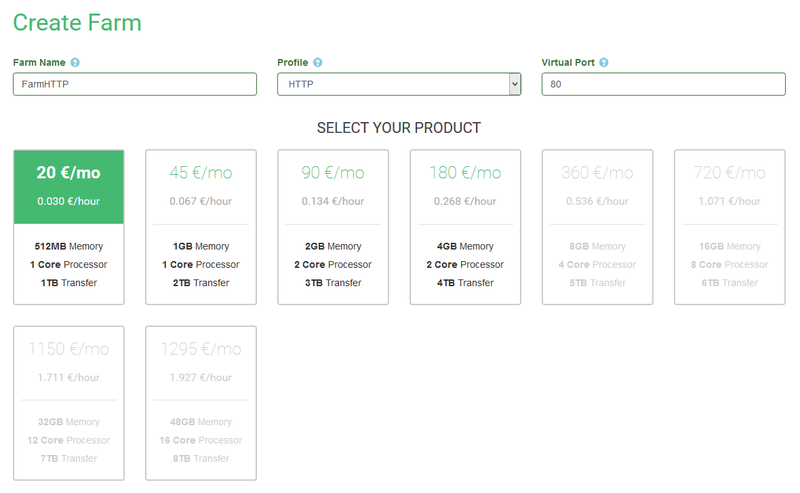 In Global tab, you can setup the main parameters. Pressing show advanced parameters… you can find and configure other parameters of the farm. Once you have made all your changes, click on the ‘Update’ button to apply all modifications. There are several advanced parameters to modify, as the number of working threads, HTTP verbs, error messages and other parameters. If the farm listener parameter is modified to https, you will be able to modify more parameters, as ciphers and certificates. 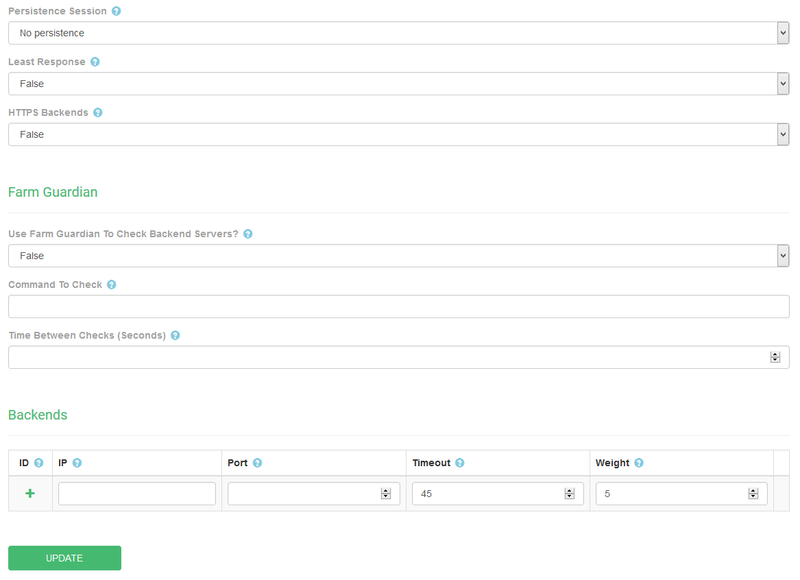 In Services & Backends tab, you can manage the service parameters (farm guardian included) and add, configure or delete backends. 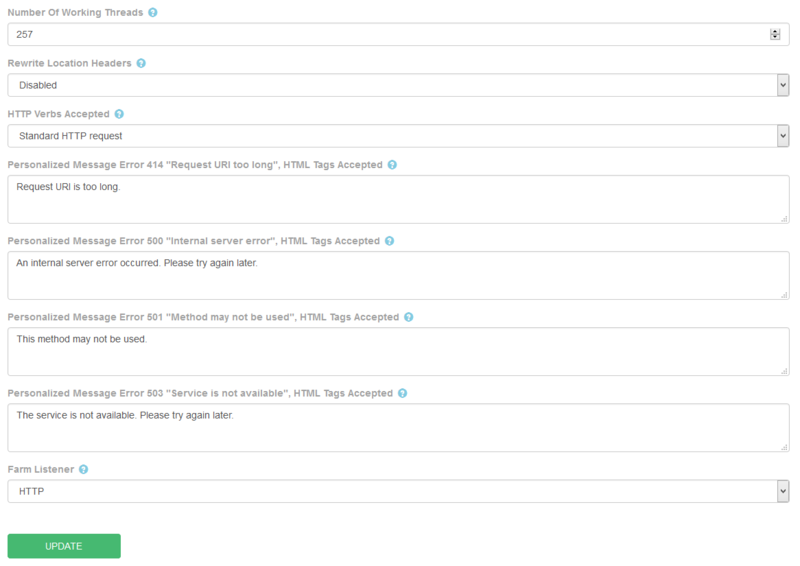 Let’s configure the Farm Guardian to check the health of the backend servers. We just have to enable the use of Farm Guardian and set a command to check and a time between checks. Once you set the Farm Guardian configuration, you just click on ‘UPDATE’ button to apply all changes. The next image is an example of a Farm Guardian configuration. If you want to add a backend, you have to insert a valid IP, port, time out and weight; then click on or ‘UPDATE’ button.